It’s what Costa Rica packs into 19,700 square miles (approximately the size of Denmark) which is astounding. This tiny country of jungle, rainforest, cloud forest, volcanoes and beaches harbours stunning flora, including 8,000 species of orchid and an amazing selection of wildlife including turtles,macaws,caiman, basilisks, monkeys, armadillos and sloths. 25% of the country is designated as national park or protected area. Costa Rica also boasts 78 rivers, of which the Pacuare and the Reventazon are a river rafter’s dream. Costa Rica was the first country we visited when we started our programme in Central/South America in 1995. In fact we were the first to feature Costa Rica as an independent fly-drive destination and many of our travellers still explore this pocket-book sized country in a hire car, allowing us to plan and pre-book their routing. Costa Rica is a safe adventure, exciting yet easy to tour for those who have no experience of travel within Latin America. Accommodation is excellent and we have chosen rather special hotels, with views, some with spas and with a higher degree of comfort. Where possible hotels will give a room upgrade for our honeymooners. Each hotel will try and do something special. So for those who feel that a honeymoon is not about two weeks on the beach or by the pool - a Costa Rica honeymoon combines adventure with special interest, exploration and, of course, a little beach and pool. On arrival private transfer (approximately 50 minutes) to the Hotel Xandari in the Central Valley with accommodation in a Prima Plus Villa for 2 nights on a bed and breakfast basis. We have featured the Xandari hotel ever since we started our Latin America programme over 20 years ago. This hotel is one of our firm favourites. It is set in the magnificent landscape of the Central Valley in 40 acres of coffee plantation and tropical gardens. All the 24 bungalows have contemporary, colourful furniture and a large, walled terrace which ensures privacy but also panoramic views. There are three swimming pools, a private trail through the estate and a waterfall. The spa offers massages, jacuzzi and yoga. Much of the food in the restaurant comes from the Xandari’s own gardens and greenhouse. A special property. The Central Valley is very lush with a mild and dry year round climate. The valley is surrounded by four main volcanoes - Poas, Barca, Irazu and Turrialba and represents over a fifth of the country’s area. Two rivers dominate, the Tarcoles to the west and the Reventazon to the east. Private guided full day tour to Poas Volcano and La Paz Waterfalls including lunch. The Poas volcano is an active 2,708 metre stratovolcano. The crater of the volcano is over a mile across. Visitors are allowed a maximum of 40 minutes in the park. 10 minutes for the trek to the crater, 20 minutes at the crater and 10 minutes for the return walk. La Paz waterfalls gardens has 5 waterfalls, safe hiking trails, aviary with numerous species of birds, insect exhibition, butterfly observatory, hummingbird garden and serpentarium. An early morning group transfer to the Pacuare Jungle Lodge. This includes a rafting trip to the Lodge. The journey in total will take approximately 4 hours. Your stay is on a full board basis for 2 nights. National Geographic rank the Pacuare as among the top river experiences in the world. The River plunges down the Caribbean slope through a series of spectacular canyons with tranquil pools after each stage. All around is tropical forest. On the final day at the Lodge, you will raft through the last section of the river (Class III and IV rapids). If you are to stay at the Lodge you should have a certain level of fitness and be able to swim and ensure that your travel insurance covers you for rafting up to Class IV. This is a unique lodge with 20 comfortable cabins set on the banks of the Pacuare river. It is also possible to access the lodge by a rough road. The staff act as boatmen, cooks, waiters and chambermaids/men. Pacuare is a member of the National Geographic Unique Lodges of the World and it certainly lives up to its name. This is luxury, not like a 5 star hotel but luxury in wooden jungle cabanas. There is a pool, bar and restaurant. Some of the cabins have their own plunge pool. Views are either overlooking the river or to the lush gardens. A special and very romantic place ! Today you are at leisure in a wonderful spot ! Activities at the Lodge can be booked and paid for locally and include a canopy tour through the rainforest, horse riding and a hike to a Cabecar Indian community. Raft out of the lodge and then by a private transfer to the 4 star Nayara Resort (approximately 5 1/2 hours in total) for 2 nights on a bed and breakfast basis. The Nayara shares facilities with its neighbour and sister property Nayara Springs (adults only). We have been informed that more than 15 sloths have taken up residence in their grounds. A sensitively designed hotel where the screened windows of the suites and villas manage to bring nature into the room itself. This luxury boutique hotel and spa is an ideal honeymoon retreat. It is located amongst tropical rainforest with views towards one of the most beautiful volcanoes one could wish to see. The bungalows, all of different size and dotted in different locations within the resort, are furnished in wood and local materials. They have outside as well as indoor showers, terraces and are furnished with colourful local materials. There are the two top notch spas, swimming pool, four restaurants and private hot tubs scattered around the gardens. Today includes a half day guided tour of Arenal’s Hanging Bridges, the best way to appreciate the tropical lushness which surrounds the most spectacular cone of Arenal Volcano. Explore the local area at leisure. Howler monkeys, macaws and brilliant butterflies flourish among the heliconias and cascading waterfalls. A multitude of activities are on offer in this tropical rainforest wonderland but one that must be appreciated is a swim and relaxation in the Ecotermales hot springs. This is a great area for walking, horse-riding and birdwatching. Private transfer to San Jose Airport (approximately 3 hours) for a flight to Puerto Jimenez or Golfito in in the far south of the country (approximately 45 mins) and then transfer by boat (45 minutes) to Playa Cativo for 3 nights on a full board basis. This delightful national park was created in 1993 and has 35,000 acres of tropical rainforest and mangroves. It has been steadily purchased with help from the Austrian government and the renowned classical Austrian violinist Michael Schnitzler. It has now been donated to the Costa Rican government. It is located across the bay from from the Osa peninsula and Corcovado National Park. The perfect romantic spot. Playa Cativo is a smart lodge located in an idyllic setting on the shores of the Golfo Dulce. There is a restaurant, bar, freshwater outdoor swimming pool, library and organic farm. The beautiful and lush gardens are abundant with butterflies , birds, small mammals and exotic birds. If you are interested in bird watching then you could not find a better place. The National Park surrounding the Lodge accommodates 750 species of trees, 140 species of mammals, 367 species of birds and 117 species of reptiles. Apart from just relaxing there is much to do in this heavenly spot. You can hike, take self-guided walks, nature tours, fish, kayak, whale and dolphin watching, snorkel, paddle board, yoga and experience the rainforest at night (all tours are payable locally except for kayaks, paddle boards and snorkelling gear which are included in room rates). Group transfer to Golfito airstrip (approximately 45 mins by boat), fly to San Jose (approximately 45 minutes) and then connect with a flight north-west to Nosara (approximately 40 minutes) followed by a private transfer to Lagarta Lodge (approximately 15 minutes) for a 3 night stay on a bed and breakfast basis. Located on the Nicoya Peninsula, this elegant boutique hotel is set on a hilltop overlooking the Nosara and Montana rivers, verdant subtropical vegetation and the Ostional coastline. A stay at the Lagarta Lodge is a fantastic end to your adventure and it enjoys stunning sunsets. There are 26 rooms; some with ocean view, some with partial ocean view and eleven with jungle/forest views. The rooms have large balconies or terrace. There are 2 infinity swimming pools, jacuzzi and spa. The Chirriboca restaurant and Gecko bar afford panoramic views of the surrounding scenery. Don’t forget to visit the Lodge’s own 90 acre biological reserve which is located below the hotel (steep steps down). 25 minutes from Nosara is the Ostional Pacific coastline, the world’s largest nesting ground for the Olive Ridley turtle. Between July and December at night there is the opportunity to view this primeval ritual of the turtles heaving themselves up the beach in order to lay their eggs. 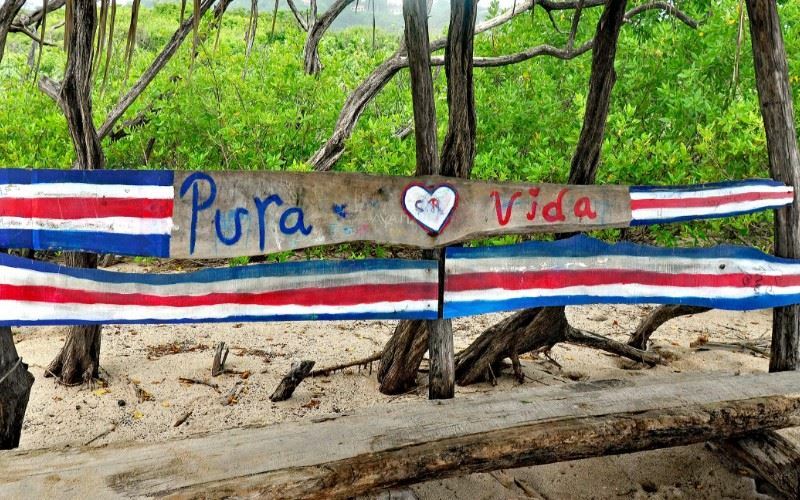 Nicoya is the largest peninsula in Costa Rica and interestingly is considered by the Quest network to be one of the Blue zones in the world where people commonly live active lives past the age of 100 ! What better recommendation! Private transfer to San Jose Airport for your flight back to the UK. The Xandari Resort and Spa is built on a coffee plantation overlooking the Central Valley. The Xandari Resort and Spa is built on a coffee plantation overlooking the Central Valley. All (except one) of the unique bungalows have a large terrace with panoramic view and a walled-in patio for privacy. All 24 bungalows have very colourful modern furnishings and private facilities (shower). The hotel has a beautiful Jalapa style spa offering massages, Jacuzzi and yoga. The small, informal restaurant has dramatic sweeping views over San Jose. It serves a variety of fruit and vegetables from the hotel’s own organic gardens and orchards. There are three swimming pools and a private trail and waterfall. Superb property and one of our favourites in the whole of Central America. Reaching this lodge by raft is all part of the experience! The lodge sits upon the banks of the river. Reaching this lodge by raft is all part of the experience! The lodge sits upon the banks of the river. Each of the bungalows have a private terrace, ensuite facilities and views to the lush garden or the river. The suites have private pools. After dark the bungalows are illuminated by candle light creating a wonderful ambience. The main lodge has a bar and an attractive restaurant. Excursions (payable locally) include a canopy tour through the rainforest, horse riding, hike to a Cabecar Indian community or you can simply relax in the beautiful surroundings. This lodge is highly recommended, particularly for a special occasion. Please Note: On your final day at Pacuare Jungle lodge you will raft through the last section of the river, riding through Class III-IV rapids. Please note that we do recommend a certain level of fitness to take part in the rafting and an ability to swim (buoyancy aids and helmets are provided). The lodge can also be accessed by a rough track if necessary. Children under 12 cannot participate in the rafting. Please ensure that your insurance covers you for white water rafting (up to Class IV). With spectacular views of the volcano the Nayara Resort is ideally situated. With spectacular views of the volcano the Nayara Resort is ideally situated. The hotel offers guests a high level of comfort and style. All 24 deluxe rooms have a king or two queen size beds, air conditioning, Jacuzzi, en suite facilities, TV, out door shower and private balcony with volcano views. In the lush tropical gardens there is a pool, three Jacuzzi's and a wet bar. The hotel's Acantha Spa offers a range of treatments including a massage using minerals from the volcano. The open air restaurant serves breakfast, lunch and dinner and offers spectacular views of the Arenal volcano. Playa Cativo is an elegant lodge accessible only by boat. It is located in an idyllic setting on the shores of the National Park, across the bay from the Osa Peninsula and Corcovado National Park. It is surrounded by 1000 acres of private land and the Piedras Blancas National Park. The lodge has a total of 18 comfortable rooms - 1 deluxe, 4 luxury, 5 premium and 8 premium plus. Each room has a view of the ocean and rainforest, ceiling fan, sofa, WiFi, safe deposit box and window mosquito screens. El Gavilan restaurant offers an a la carte menu accompanied by a premium wine selection. There is a freshwater outdoor swimming pool, library and organic farm. The beautiful and lush gardens are abundant with butterflies, birds, small mammals and exotic plants. There is an excellent choice of activities including kayaking, hiking, fishing, stand up paddleboarding and yoga (some activities are payable locally). There are trails that lead from the property. An ideal place for combining activities with relaxation. Suitable for both honeymooners and families with older children. Highly recommended. This elegant boutique hotel is beautifully situated on a hilltop overlooking two rivers (Nosara and Montana), verdant subtropical vegetation and the Ostional coastline. A real oasis and the views are truly breathtaking. This elegant boutique hotel is beautifully situated on a hilltop overlooking two rivers (Nosara and Montana), verdant subtropical vegetation and the Ostional coastline. A real oasis and the views are truly breathtaking ! There are 26 rooms across 3 rooms types - 7 Flor Blanca (ocean view), 8 Panorama (partial ocean view) and 11 Jungle (jungle/forest view). The rooms have ceiling fan, air-conditioning, safe deposit box, hair dryer, telephone, coffee espresso machine, minibar and a separate sink. On the balcony (or terrace) there is a table and chairs and hammock or luxury sofa. There are mosquito screens on the balcony doors and in the bathroom. There are two infinity swimming pools and a jacuzzi. It is the perfect place to enjoy the amazing sunsets ! Chirriboca restaurant serves both local and international dishes - mainly from regional organic farms. It is also open to non-residents. Gecko lounge (located above restaurant) has a bar and extensive seating areas. Both the restaurant and lounge enjoy stunning views of the surrounding scenery. The hotel owns and maintains its own private 90 acre biological reserve which is situated below the property (with direct access - steep steps down). There are mangrove trees and marked forest trails. The hotel operates two hour walks in the reserve in order to observe the birds, monkeys, butterflies and insects. The reserve director/guide is based at the hotel and is supported by an additional guide. There is also a gift shop, lookout tower, meeting room, art-gallery, wine cellar (private dining room) and private car parking. The Spa Vista Manglares is due to open shortly. It will have 3 treatment rooms, jacuzzi and yoga studio. There is a good choice of activities such as boat trips, kayaking, walking and stand up paddle boarding. There are complimentary shuttle buses to the nearby beaches of Guiones and Pelada. Both Pelada and Nosara beaches are approximately a 15 minute walk (subject to the tide). In addition the charming beach of San Juanillo with several boat tours is a 40 minute drive from the hotel. The Ostional coastline (25 minutes from Nosara) is the world’s largest nesting ground for the Olive Ridley turtle between July and December. The airstrip of Nosara is approximately 10 minutes away with regular flights from San Jose (30 minutes) and Liberia (15 minutes). It is approximately 2 hours 45 minutes from Nosara to Liberia airport by land. This special property should not be missed and comes highly recommended ! 11 hours. BA direct flight from London Gatwick.